Monica Melissa Patterson, far left, and her defense team listen to testimony from witness Raquel Ybarra during Patterson's capital murder trial in the 370th state District Court at the Hidalgo County Courthouse on Oct. 5, 2017, in Edinburg. EDINBURG — The defense has spent much of the past two weeks of the Monica Melissa Patterson murder trial trying to undermine the credibility of the witnesses called by the prosecution. This didn’t appear to be the case on Friday when Danielle Martinez, the administrator of Harlingen-based Greater Valley Hospice, didn’t flinch during her two-hour testimony. Most of her time on the stand included her spirited exchange with defense attorney Fernando Mancias, who cross-examined a witness for the first time Friday. In addition to Mancias, Patterson is also represented by Ricardo “Rick” Salinas, O. Rene Flores and Calixtro Villarreal. Patterson, 50, is charged with capital murder for allegedly killing Martin Knell Sr. in January 2015 to access the 96-year-old’s million-dollar estate. Martinez told jurors she arrived to work on Nov. 25, 2014, to find a missed call from Patterson, Comfort House’s administrator at that time. The McAllen hospice center is where Knell’s wife, Thelma, was a patient between September and October 2014. Thelma Knell died on Oct. 23 of that year. Greater Valley Hospice was providing grief counseling to Knell in the wake of his wife’s death. Patterson had called Martinez to explain an encounter Raquel Ybarra, a social worker at Greater Valley Hospice, witnessed during a house visit with Knell on Nov. 24, 2014. The call was made the day after this encounter. Ybarra testified Thursday that Knell was angry with Patterson for making herself payee upon death to his stocks without his knowledge. He also told Ybarra he wanted Patterson to return $300,000 in cash in addition to removing his name from the stocks. When Patterson arrived during Ybarra’s visit, Knell mentioned that he “was planning on dying soon without knowing it,” according to Ybarra’s case notes from the visit. Concerned with potential elder financial abuse, Martinez explained to jurors she had documented her returned call to Patterson. Martinez said Greater Valley Hospice employees are required to report such cases. During the call, Patterson stressed to Martinez that Knell was angry and confused, reiterating that lawyers were involved and that everything she was doing was legal. Patterson did not, however, provide Martinez with any details, according to the witness’s testimony. Patterson also told Martinez during the call that Knell’s son, Martin Knell Jr., was aware that she was taking care of his father’s financial affairs, Martinez testified. Patterson added that Knell’s son signed over his father’s medical responsibilities to the defendant. Knell Jr.’s testimony on Tuesday contradicted as much. The trial’s first two weeks of testimony indicate that the relationship between the victim and his son was strained. Martinez’s testimony Friday was not the exception as the witness referred to the “tension” existing between the two heightening after Patterson made the initial police report against Knell, which was shortly after his wife was admitted to Comfort House. Knell was led to believe his son had filed this report, according to Martinez. Less than two hours after speaking with Patterson on the phone, Martinez testified that she also received a call from Knell, who was using the defendant’s cellphone. During their entire conversation — in which Knell apologized for the mix-up, saying he sometimes forgot what he had agreed to and emphasized that he didn’t want Patterson to get in trouble — Martinez testified that she could hear Patterson whispering to him in the background. Martinez also addressed a Dec. 15, 2014, letter that has come up multiple times during the trial that Knell allegedly sent to Greater Valley Hospice. The letter asks that they no longer provide services to him. In it, he accused employee Francisco “Frank” Perez of stopping by his home for nearly seven hours on Dec. 11, 2014, something which Perez denied when he took the stand the first week. Martinez testified that she investigated Knell’s allegation and determined Perez was not there. She refused to answer questions relating to unspecific dates or time periods, telling Mancias she’d have to look through her records to answer. Mancias often paused to confer with rest of the defense team. Unlike other witnesses, who appeared to concede to leading questions, Martinez was unfazed by vague questioning. 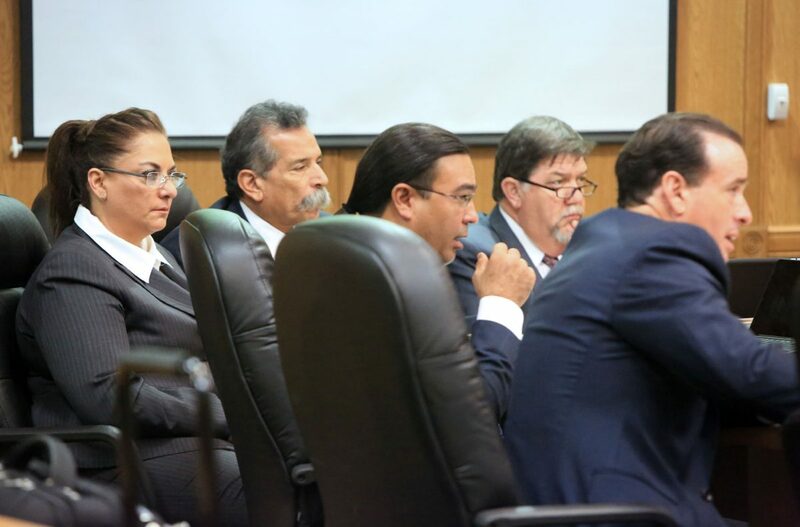 Patterson was seen whispering to her legal team throughout Mancias’ cross-examination of Martinez. The Hidalgo County Courthouse is closed Monday in observance of Columbus Day. Witness testimony will continue Tuesday as the prosecution continues to build its case against Patterson. A number of key witnesses have yet to take the stand, including Knell’s former housekeeper, who witnessed Patterson enter his home the day he died, and the doctor who conducted the victim’s autopsy.